Home > Fulgurite Lightning Sand Jewelry Art Gifts Tubes Glass Sculptures > Large Quality Fulgurite Lightning Sand "Happy Hula Dancer"
Large Quality Fulgurite Lightning Sand "Happy Hula Dancer"
This specimen is a great, large whitish glass lined quality fulgurite naturally shaped in the style of a "happy hula dancer." It has an all-natural glass interior, with a naturally welded sand exterior. Very cute with little bushy, waving arms. The difference between fine art and nature's natural creative process - lightning fused sand - is that nature is much better at creating things of beauty. This classic fulgurite is one that everyone tries to find. It has so much character and charm! It is also the real stuff of Hollywood movies and legends! It makes a wonderful decorative piece or an inspired gift for any nature lover who enjoys the creative genius of the flash of a lightning bolt across a dark sky. Shipped in a display case with Certificate of Authenticity and information. The name tag base is included. The plexiglass square base and and cube is not included. 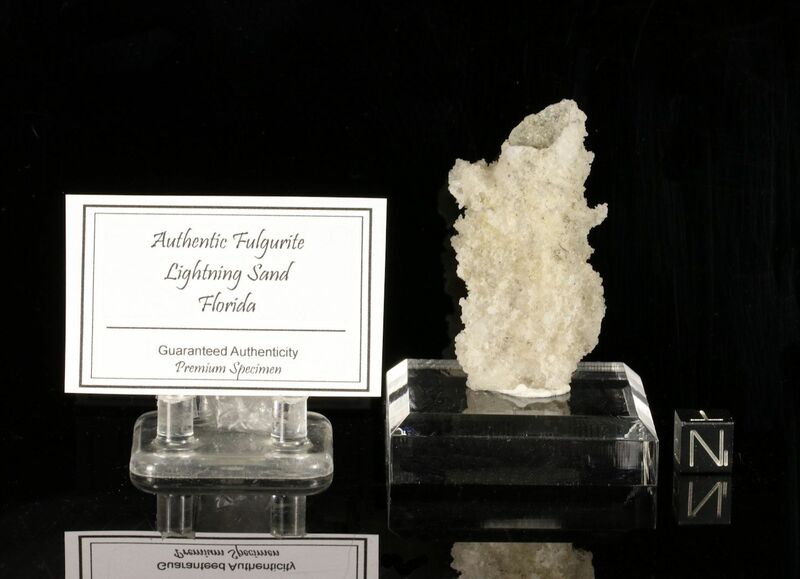 The Lore and Folk History of Lightning Sand: Promotes Good Luck, Success, Serendipity, Inspiration, Enthusiasm and Creativity.